As the fast developing world of personal grooming and skincare grows in Africa, so too does the desire to find products that harness the unique natural ingredients from the continent for their inspiration. One luxury brand, ORÍKÌ, is not only creating a range of products that truly celebrate Africa’s natural resources, but it also positively touches the lives of those who harvest those raw materials. LoA spoke to ORÍKÌ founder, Joycee Awojoodu, this month to find out more about this great new luxury brand. ORÍKÌ is a leading luxury personal grooming brand that fuses natural ingredients andscientific research to create extraordinary personal care products. We create effective and luxurious beauty and grooming products utilizing raw materials and all natural resources discovered around the world. The range of 32 products is for the ORÍKÌ woman and man covers the full spectrum of serums, moisturizers, body wash, moisturizers, exfoliates, toners, treatments, masks and more. Botanically based, we use potent plants, organic ingredients and 100% natural essential oils. "ORÍKÌ is a leading luxury personal grooming brand that fuses natural ingredients andscientific research to create extraordinary personal care products." "I am passionate about creating an African indigenous luxury brand that touches the lives of the women and men who gather the nuts, plants and herbs to produce the raw materials." I am passionate about creating an African indigenous luxury brand that touches the lives of the women and men who gather the nuts, plants and herbs to produce the raw materials. The company is committed to sourcing the best quality and finest selection of products. At ORÍKÌ, we aspire to make a difference. Our success is the success of every individual that touches the product across the value chain, and this keeps us motivated. Income from fairly traded raw materials and production of all natural products can provide a better life for families. We are inspired by the life transforming potential of creating an indigenous quality, proudly African beauty brand. 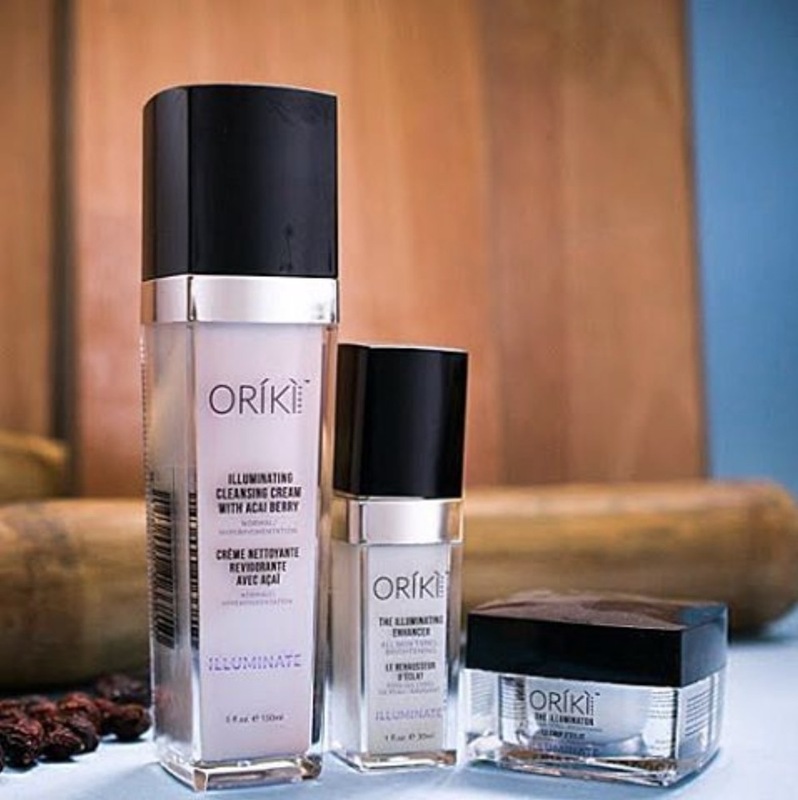 At the heart of the ORÍKÌ brand, is utilizing all-natural ingredients that are botanically based and largely sourced from the Continent of Africa. Our products are free of unnecessary additives, parabens and sulfates and we are inspired by the fact that when you purchase the various ORÍKÌ products, you empower people across the value chain. "At the heart of the ORÍKÌ brand, is utilizing all-natural ingredients that are botanically based and largely sourced from the Continent of Africa." "ORÍKÌ is poised to go global as a proudly African all-natural personal grooming & lifestyle brand. Beyond our international and global aspirations, at ORÍKÌ we aspire to make a difference." Joycee Awojoodu is the Founder/CEO of ORÍKÌ Group. She is an entrepreneur, economist and power sector specialist. She has a history of running companies, in Nigeria mainly: ORÍKÌ, a luxury personal grooming brand that fuses all-natural ingredients primarily sourced from the Continent of Africa with scientific research to create extraordinary personal care products for women and men; and PowerCareers – a leading recruiting & training solution for the colossal human capacity gap in Nigeria's energy sector. Joycee has completed Universal classes accredited by the International Association for Continuing Education and Training (IACET) and is certified in natural skin care and actively leads the research and innovation of the ORÍKÌ brand. She most recently worked for the United Kingdom’s Department for International Development’s (DFID) infrastructure assistance programme in Nigeria, the Nigerian Infrastructure Advisory Facility (NIAF) as the Technical Assistant on Research, Analysis and Informatics (Performance Monitoring) to the Honourable Minister of Power for the past 2 years. In this role, she worked on the ongoing reform, privatisation and future policy strategy for Nigeria’s power sector. She began her career in power at Constellation Energy, a Fortune 100 company in the United States. At the age of 23 she started a successful energy brokerage firm focused on the supply of renewable energy, natural gas and electricity across four states in the USA. A few years later she decided to move to Nigeria, having never been before, to pursue her ambition of contributing to the realization of stable and reliable electricity for all. Prior to her role consulting for the Nigerian Federal Government, she commenced work in Nigeria in the Renewable Energy Research and Development Team at the Nigerian Electricity Regulatory Commission (NERC) where she created policies for incentivizing renewable energy investment for the Federal Government of Nigeria. Joycee was a part of the team that developed the renewable energy tariffs that still hold today for investment in Nigeria’s power sector. As the former Curator of the World Economic Forum Abuja Global Shapers Hub, Joycee led a team comprised of 21 entrepreneurial young leaders, on a number of community initiatives focused on education, youth unemployment and entrepreneurship. She has been selected to attend three World Economic Forum events around the world and has been an invited speaker on leadership, youth development, energy access and energy solutions in emerging countries. One of the staple initiatives during her tenure as Curator was the development of Employability & Entrepreneurship Workshops which have reached over 750 young people in Nigeria thus far. The project aims to tackle youth unemployment in Nigeria by delivering employability skills, entrepreneurship training and jobs. One of Joycee's long term aspirations is to be a mass employer of labour in developing nations and growth markets and she intends to achieve this by utilizing her company - REDESOL Group ‘Resource and Development Solutions,’- dedicated to making an impact on the Continent by investing in the resource potential across various sectors including energy, commodities and agriculture. Joycee is a World Economic Forum Global Shaper, a nominee of The Future Awards Prize in Public Service, 2013, selected into the African Leadership Network, and a Tony Elumelu Entrepreneurship Program Fellow. Anuoluwapo Sijuade is the Finance & Accounting Officer at ORÍKÌ Global & Synergy Limited. She graduated from the Obafemi Awolowo University, Ile Ife, Nigeria with a Bachelors’ Degree in Accounting. She became an Associate Member of the Institute of Chartered Accountant of Nigeria (ACA) in November 2006. She is a fervid and analytical minded lady with great team spirit. Prior to her current role, she was a Banking Officer at Guaranty Trust Bank Plc for two years before proceeding to Family Health International (FHI 360) as an Accountant. Her experiences in Audit, Banking, the Development Sector and other profit making institutions accounts for her competencies in financial management, presentation and reporting, controls, budgeting, selling, relationship management, grant administration and management, to mention but a few. Anuoluwapo is a lover of God and humanity. She has been involved in several social works in her community. As a member of the Millennium Development Goals (MDGs) Awareness Creation Team, she has led team visits to orphanages and homes for the handicapped, coordinated community sensitizations on environmental sustainability, and equipped a library for a school project. Loveth Onyinye Amalu is the Administrative / Human Resource Officer at ORÍKÌ Global and Synergy Limited. She graduated from Enugu State University of Science and Technology with a Bachelor of Science degree in Microbiology. A purpose driven, detail and goal oriented person with notable experience in Administration and Human Resource Management – overseeing the effective running of the organization, recruitment procedures, performance appraisal, staff welfare and job scheduling. She is a Certified Professional in Health and Safety and has worked as a Laboratory Scientist at the famous University of Nigeria Teaching Hospital Enugu specifically responsible for biochemical and microscopic analysis of clinical samples. Loveth is an ardent member of the Team Rebuild Education Initiative, a non-governmental organization set up to rebuild the old ruins of education and making reading fun. In her leisure period, she spends time impacting young minds at the i-Book Lounge Limited and her patience with kids endears them to her. She was awarded the Best Staff of the Year 2015 at ORÍKÌ Global & Synergy Limited. Ifeanyi Nkemneme is the Marketing Executive at ORÍKÌ Global & Synergy Limited. He graduated from Covenant University Ota, Ogun State, Nigeria with a Bachelors’ Degree in Petroleum Engineering. Though an Engineer by certification, his roles in sales and customer support provision in his work experience engender his successful performance as a marketing executive. Prior to his current role, he was the Marketing Executive at Drinks.ng where his job roles ranged from liaising and networking with a range of stakeholders including customers, colleagues, suppliers and partner organizations to creating and evaluating marketing campaigns and communicating with target audiences and managing customer relationships. Ifeanyi is kind-hearted, a sport lover and a wonderful swimmer - additionally, he was a volunteer executive at the Youths Alive Program which was a campus based mission, reaching out to university students and they addressed social vices like cultism, drug abuse, HIV/AIDS prevention and prostitution. The mission witnessed combined weekly attendance of over 700 students. "Our products are intended to be utilized by connoisseurs worldwide, and on supporting and enriching the lives of farmers who keep our culture alive through programmes such as ‘From Plant to Profit,’ our commitment to promote Sustainable Agriculture and empower farmers as a means of job creation, poverty reduction and economic development." I have been passionate about entrepreneurship from a young age. My experience as a serial entrepreneur has been a great one. I am exhilarated by the opportunity to create and develop ideas. A few of the companies I started are still going strong today and I have learned that it is important to be passionate about your business in order to sustain it. Passion is only one component, it is also essential to have a great team, do ample research, and have a sound plan for building the business. ORÍKÌ is poised to go global as a proudly African all-natural personal grooming & lifestyle brand. Beyond our international and global aspirations, at ORÍKÌ we aspire to make a difference. Our success is the success of every individual that touches the product across the value chain, and this keeps us motivated. We are intent on producing the best quality products with natural, botanically based ingredients sourced predominantly in Africa and reaching many corners of the globe. Our products are intended to be utilized by connoisseurs worldwide, and on supporting and enriching the lives of farmers who keep our culture alive through programmes such as ‘From Plant to Profit,’ our commitment to promote Sustainable Agriculture and empower farmers as a means of job creation, poverty reduction and economic development. We aim to practice what we preach; we believe in creating a luxury proudly African brand, focused on quality, and reflecting the highest standards. We obtain our ingredients products using not only local resources but superior materials. Through this, we are committed to sustainability and empowerment, and support the preservation and promotion of African culture through extraordinary creations. Through the ORÍKÌ Foundation, we strive to expand the meaningful income of farmers we work with by providing market routes for their products, and keeping commercial value in Africa, where it is often lost. "A few of the companies I started are still going strong today and I have learned that it is important to be passionate about your business in order to sustain it." The ability to make an impact. I am driven by the opportunity to create and to build and to touch lives in the process. Africa is rich in natural resources and human resources and I believe in its potential to be great and utilize industries such as agriculture to add value. Be relentless, never give up. Pursue your dreams with fervor and network. You would be surprised how far having faith coupled with action will take you!